Tonight is my writers' group meeting, and I'll be bringing my picture book manuscript. Again. Yes, you may well wonder how long it takes to write a picture book. It takes me a while. At any rate, today I'm offering you some more humor picture books from my research on same. I'm talking just two authors. I've certainly heard plenty about Mo Williams over the years, but when I read one of his books years ago, I was impressed by the illustrations but not so much the text. Now that I've read his Pigeon books, though, I totally get him. 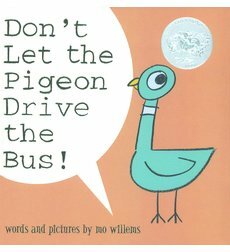 Don't Let the Pigeon Drive the Bus! 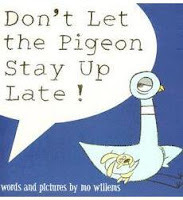 and Don't Let the Pigeon Stay Up Late! are funny in concept and in incredibly simple execution. On top of that, I think few children will be able to resist interacting with the adult reading these to them. I want to read these to somebody! William Joyce is an author I've liked for a long time. The retro, intensely representative art work...the slightly twisted narratives... Love it all. 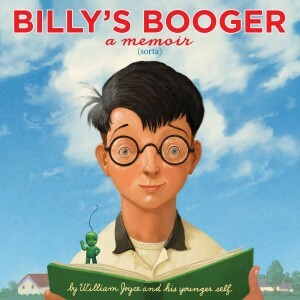 Billy's Booger, A Memoir is a very clever, funny-in-a-subtle-way, picture book for older kids, older kids who have experienced writing stories for school. The story involves a fourth-grade boy writing a kids' book for a contest. His entry, Billy's Booger, The memoir of a little green nose buddy, appears in the center of the book on smaller, colored pages, with its text looking as if handwritten, its illustrations appearing as if done by a gradeschooler. You get a real book within a book. Memoir seems like a neat genre to discuss with and teach young kids, since it would help them understand how their lives can become material for their writing. I had suggestions for humor picture books from a couple of people the last time I posted about them. I haven't forgotten. At some point, I'll be taking a look at those titles.